In spectroscopy the hardware is only as powerful as the software that runs it, and the software is only as accurate as the library it can use to match analytes. 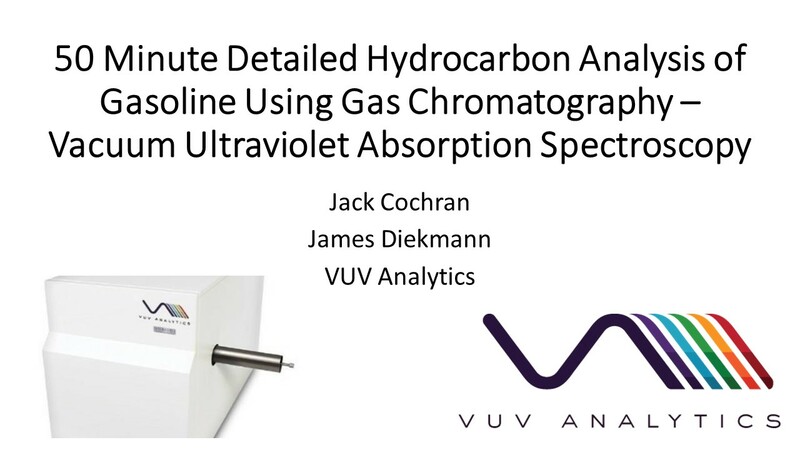 In Part 1 we posed the question, “Can jet fuel be analyzed using GC-VUV?” With the current VUV spectral library, that answer is “not well” (Figure 1). So, in Part 2 of our series Flying at the Speed of (Ultraviolet) Light, we’ll walk through the steps we took to get the library jet fuel ready. A few caveats before we proceed with building out the library. I touched on the increased complexity of jet fuel last time, but let’s elaborate on a couple specific points. First, olefins typically are not present in jet fuel. However, their absorbance spectra have response in both the saturate (125-160 nm) and aromatic (170-200 nm) regions. Thus, any reported olefin values are likely some coelution of saturates and aromatics. We can mitigate this to a degree by expanding both saturate and aromatic library spectra, but this segues into my next point. As we get to higher carbon numbers, it becomes nearly impossible to classify saturates for a few reasons. 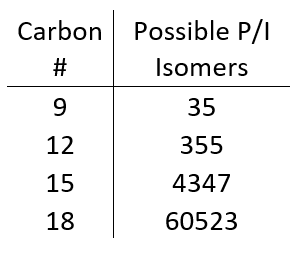 First, the number of isomers increases dramatically with increasing carbon number (Table 1). This is complicated even further by the fact that, with increasing carbon number, compounds can have any combination of isoparaffin, olefin, naphthene, and aromatic moieties, which can really muddy the absorbance spectrum and make one analyte looks like two or three. Lastly, at higher carbon numbers (above C10 or so) the absorbance spectra of isoparaffins and naphthenes are too similar to differentiate in a complex sample. Table 1. The possible number of paraffin (P) and isoparaffin (I) isomers increases by an order of magnitude every 3 carbons! With all that being said, we can still match both ASTM D1319 and D1840 in terms of the type of data reported. The saturates, mono-aromatics, and di-aromatics are all spectrally distinct, and we shouldn’t really be seeing olefins in finished jet fuels. The limiting factor is the available library spectra to properly match. The current VUV PIONA library is only built for gasoline which ends at C12. Thus, we’ll need to do some work to extend the saturate, aromatic, and di-aromatic spectra out to an appropriate carbon number. The saturates were the easiest to extend precisely for the reason they’re so hard to differentiate at higher carbon numbers: the spectra for a C11 isoparaffin, a C13 naphthene, and a C15 isoparaffin are essentially the same. For each retention index (RI) range starting at 1200 (we use a default RI range 25 for VUV Analyze), several spectra representative of higher carbon saturates were added every 5 RI, up to an RI of 1900. The differences in response factors and densities becomes negligible past C11 or C12, so this gives us quite an accurate approximation for any of the higher-carbon saturates. For the aromatics, a little more sample preparation was required, as the λmax is harder to predict for aromatics with various aliphatic side chains. A jet fuel sample was fractionated into its saturate and aromatic components using a Restek Resprep EPH Fractionation SPE cartridge. The aromatic portion was run under ASTM D8071 run conditions (with the maximum oven temperature raised to 235°C), and as many clean spectra as possible were added to the library with the corresponding RI values. Finally, for the di-aromatics we employed the help of mass spectrometry. Running the aromatic jet fuel fraction under translated D8071 conditions and extracting ion chromatograms, we could identify peaks for all the di-aromatics and mark their RIs. Going back to the aromatic fraction run on VUV, we found the corresponding peaks and added as many clean spectra as possible for the C2-C5 naphthalenes. And voila! We now have a library for jet fuel range! Now that the spectral library can match the full jet fuel range (Figure 2), we can analyze some real samples. And that’s exactly what we did, coming up in Part 3 of Flying at the Speed of (Ultraviolet) Light! Figure 1. GC-VUV chromatogram of jet fuel. The gaps without colors (cf. black arrows) indicate a lack of absorbance spectra in the library (top), leading to underreporting, especially for saturates and mono-aromatics. This is even more apparent when the isoparaffin filter is removed (bottom). The percent area rejected for this run is 7.75%. Figure 2. GC-VUV chromatogram of jet fuel. The isoparaffins in the library were extended out to an RI of 1900 (top). The mono-, di-, and tri-aromatics were expanded as well (bottom; isoparaffins not plotted). The percent area rejected dropped to 0.39%!